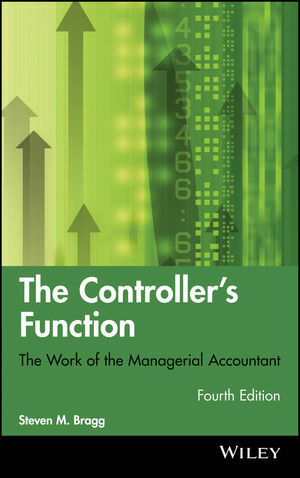 From flex budgeting to detailing the more sophisticated skills like throughput analysis for capital investments and the fast close for public companies, The Controller's Function, Fourth Edition offers numerous real-world examples, expertly balancing both the technical and managerial sides of the job. Comprehensive and practical, this book fully defines the role, functions and responsibilities of the managerial accountant in a corporation. Steven M. Bragg, CPA (Centennial, CO), has been the chief financial officer or controller of four companies, as well as a consulting manager at Ernst & Young and auditor at Deloitte. He is the author of over 30 books primarily targeted toward corporate financial leaders (controllers, treasurers, and CFOs) and their needs. Bragg received a master's degree in finance from Bentley College, an MBA from Babson College, and a bachelor's degree in economics from the University of Maine. Janice Roehl-Anderson (Cherry Hills Village, CO) is the Principal in Charge of Deloitte's Enterprise Applications practice in the Northern Pacific Region. ?She has over 20 years of global systems-related experience in a variety of sectors including Consumer Business, Media and Entertainment, Communications, High-Technology Manufacturing, State and Local Government, and Financial Institutions. Additionally, she has extensive experience with global implementations and with mergers, acquisitions, and divestitures and is responsible for coordinating Deloitte's enterprise applications-related efforts on MA&D projects.? ?Janice has a Bachelor of Business degree from the University of Washington and an MBA from the University of Southern California in Accounting and Information Technology. She has co-authored over ten books for John Wiley & Sons.